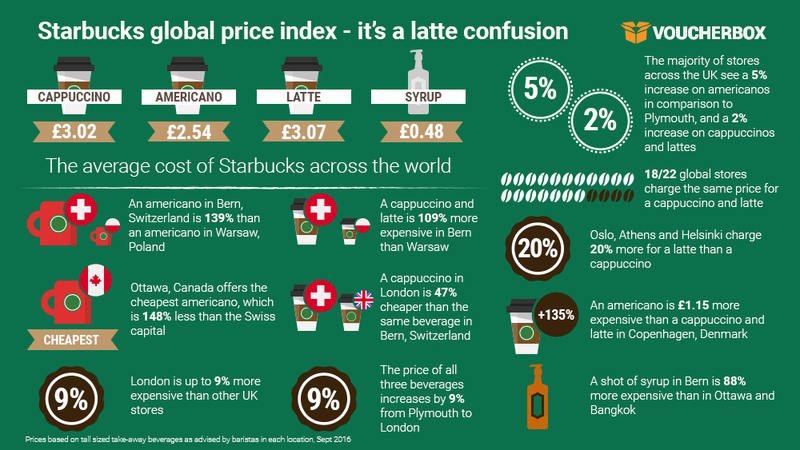 A Starbucks coffee in London is almost half (48%) the price of the same beverage in Bern, Switzerland, who top the list for the most expensive drinks from the chain worldwide. Delight may be short-lived however, as money-saving website Voucherbox.co.uk reveals the confusing pricing strategy exists across the nation, with London and Edinburgh being the priciest locations to grab a Starbucks in the UK. The Voucherbox study, which looks at the cost of the most popular drink orders across the world, reveals a 139% price increase in an americano and 109% for a cappuccino and latte between Warsaw in Poland and Bern. Ottawa, Canada actually offers the cheapest americano at £1.72, which is 148% more expensive than the same beverage in the Swiss capital. Looking closer to home, the price of all three beverages increases by almost one tenth (9%) from Plymouth (£2.25) to London (£2.45). However the south-west city seems to adopt its own price list as the majority of stores nationwide see a 5% increase on americanos, and a 2% increase on cappuccinos and lattes. As you may expect, 18 of the 22 stores investigated charge the same price for a cappuccino and latte. 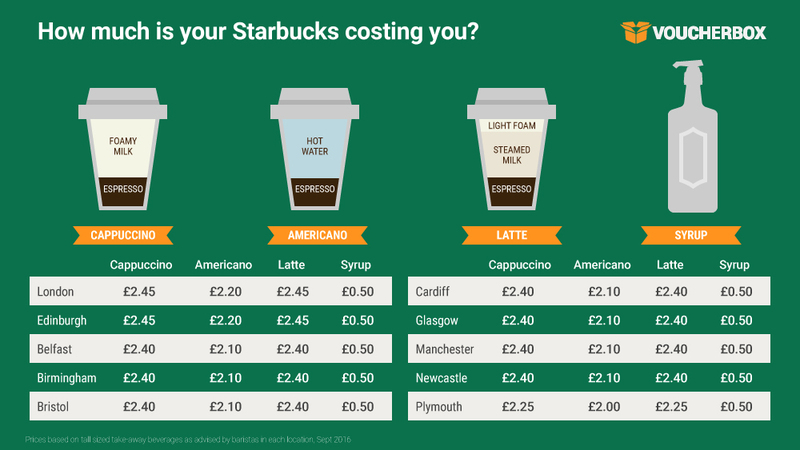 Starbucks customers in Oslo, Athens and Helsinki will pay a premium for their latte with the cost up to 20% higher than a cappuccino, whilst Berliners in Germany will find the cost of their cappuccino 9 pence more expensive than a latte. 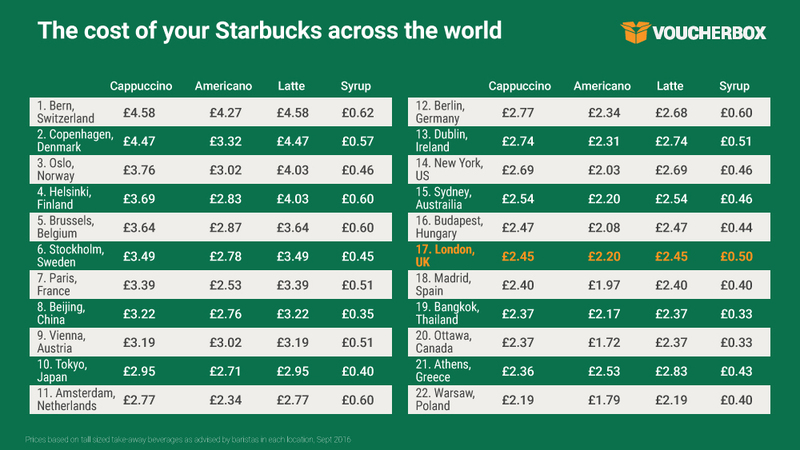 The price of an americano in comparison to its milky cohorts is most confusing of all, as the difference varies in almost every store, from a 17 pence increase in Vienna, Austria to a huge £1.15 in Copenhagen, Denmark – that’s 135% more expensive than the total average (49 pence). As if that wasn’t baffling enough, Athens in Greece has an upside down pricing strategy where an americano is 17 pence more expensive than a cappuccino, yet 30 pence cheaper than a latte. Interestingly, syrup is the same price across the UK (50 pence), which is surprising given the huge variation of this sugary shot across the globe. Despite China’s beverages costing a pretty penny (8th most expensive out of 22), the syrup can be added for a mere 35 pence – that’s 46% less than France and Austria, who sit either side of them on the table. If this research was a comparison of syrup alone, Beijing would be the third cheapest. Bern can still boast being the most expensive however (62 pence), and may leave some customers with a bitter taste when they realise this is an 88% increase on the 33 pence syrup offered in Ottawa and Bangkok. Feeling depresso? Check out the latest Starbucks voucher codes, available in the UK, US, Canada and Germany.